Available on Special Order - Tomatillos and other special varieties of vegetables. Please contact a Jain Farm Fresh Foods, Inc. Frozen Ingredients Division sales representative with your request for specialty cuts, custom processing, bulk tote and foodservice packaging. Contains Reduced Moisture Fire Roasted (RMFR) Yellow and Red Bell Pepper strips along with strips of Green Anaheim Chile Peppers and Yellow Onions. Contains Reduced Moisture (RM) No-Heat Green Jalapenos (Diced), RM Tomatoes (Diced), RM Red Onions (Diced) and slices of IQF Black Olives. 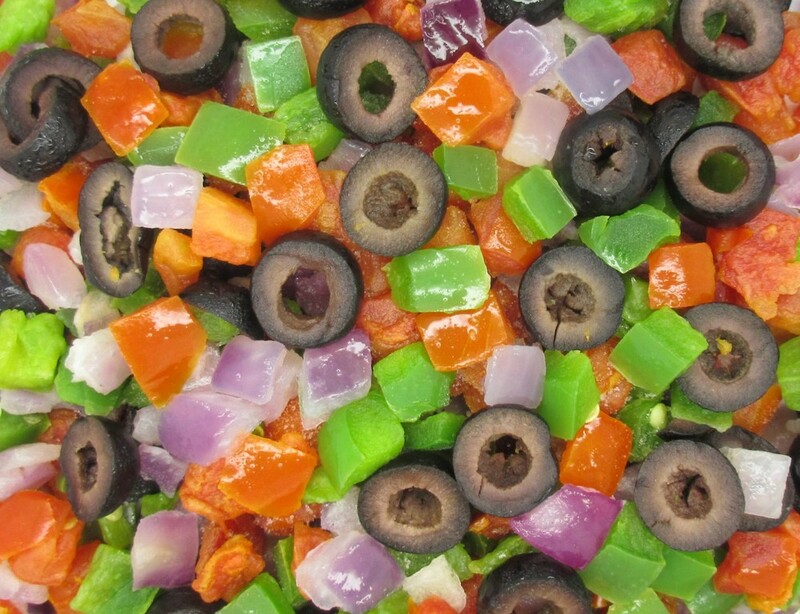 Contains Red Onion strips, sliced Black Olives, strips of Red Bell Peppers, Green Bell Peppers and Yellow Bell Peppers.